Turn the abstract concept of time into a concrete method of teaching anticipation of time and effort. Improve organizational process of planning, sequencing and time management in order to complete required tasks in a specific time frame. 1. Create a closed structure (for example, a square, triangle or cube) to display to the child as a model. Therapist Tip: Be sure not to make a line because that can sometimes be misunderstood in that it could continue on forever. 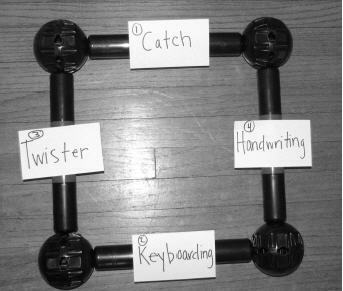 The goal of this activity is to provide a concrete way to demonstrate time. The size and shape of the structure will depend on the number of tasks you have planned and the amount of time estimated to complete each task during the therapy session. That is, a 60 minute therapy session may equal three tasks if 20 minutes are alloted for each task. Therefore, three tasks can be completed, so use a triangle (since it has three sides). 2. Lay out in front of the child the pieces to make the same structure as the model. (That is, for a triangle, lay out three tubes with one sphere attached to each tube). 3. On the notecards, write the tasks that need to be completed. Continuing with the triangle example, Card #1 may read “swing time,” Card #2 may read “letter practice with clay,” and Card #3 may read “handwriting practice”). 4. Tape one card to each tube. 5. 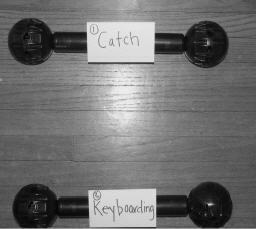 Present the set up tubes with notecards attached in a list format (top to bottom – with the first activity to be completed at the top and the last activity at the bottom) to the child. Be sure to be seated in a quiet area to minimize distractions. Depending on the amount of time estimated to complete each activity, give the amount of time a specified length of tube. For example, 15 minutes may be demonstrated by an 11” tube; 20 minutes by a 16” tube; 30 minutes by a 24” tube. If working for a long amount of time, use the 36” tube to provide a visual cue of longer periods of time. If a child is not yet reading words, use pictures (drawn or with Boardmaker™ ) of the activities that are planned for the therapy session. 1. Seat the child with the activity tubes in list format to the left of the child. 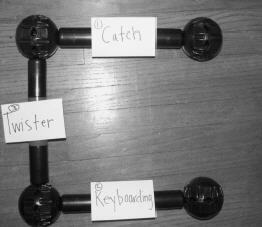 4. Review the activity tubes with the child, telling him/her what is expected of them during the therapy session. Verbally presetting a child in this way assists the organizational process and allows them to anticipate the sequence of events for the therapy session (30/60 minutes). 5. Ask the student to read the first activity on the list (top). Providing a list also adds structure to the child’s therapy session and facilitates an organized approach to a task – a specific beginning point and specific end to the session. 6. 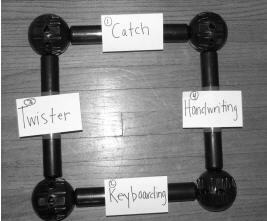 Complete the prepared activity and place the first tube (with the activity on the index card) in a position that will begin the shape (either the top of the shape or the left as this also provides a structured approach to task and requires the eyes and brain to proceed using the same approach as reading – top to bottom and left to right). 7. Complete the next task prepared for the therapy session and place it beneath the first task’s tube. Ask the child how many tasks are left until he is finished the therapy session. He could either look at the shape/structure to identify how many missing pieces there are, or he could look at the list and identify how many tasks are left on the list. 8. Continue this pattern until the therapy session is complete. 9. When the activity is complete, move on to the Discussion and Processing questions. The student is able to see that there is only one last task to complete. The student is able to visually identify that all the tasks have been completed and that the therapy session is finished. Did the child demonstrate a longer attention span to the planned therapy tasks with structure? Did the child demonstrate less distractibility or less frustrated behavior (that is, getting up and walking around in the middle of a task)? Did you like doing this throughout the therapy session? What did you dislike? Why? Did you observe a difference in behavior or attention span with the therapy session structured in this way? What were the differences? Were the differences helpful for the child’s learning or did it appear to distract the child further? How could we work together to utilize this strategy across all areas of the child’s day? 1. For a group of students. Apply the same strategies of organization and time management to a group therapy session. Upon completion of each task, a different member of the group can add another piece to the shape/structure. 2. Using pictures instead of words. 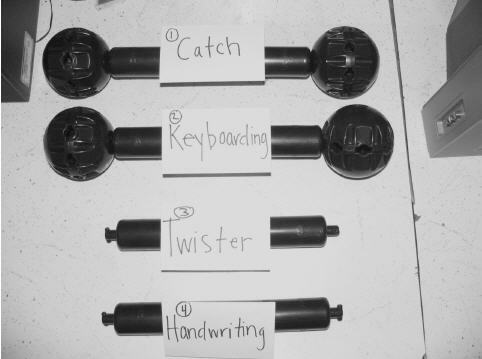 pictures with the words to begin associating the activity with the words.